Persistence is not usually a word I think about when I think about prayer. Usually, concepts like “holiness,” or “intimacy,” or “down-on-your-knees-with-your-face-stuck-in-the-carpet-while-the-snot-and-tears-flow,” (really theologically appropriate kind of things) are what come to mind. But lately I have been challenged in the words I use to think about prayer. And it all started with a letter Lillian received the week after her baptism. “Ms. Scotty,” or Scotty Sanders, is a woman in our church who has left a profound legacy of faith and prayer in the lives of many. Scotty directs the Faith Center of First Baptist Church and runs everything from the clothes closet to the food pantry to the job training center to after-school-tutorials and daycare for under-privileged children. While Ms. Scotty has never had any biological children, she has more children than any one person could count. Through her day in and day out actions of surrender, love, and sacrifice, she has parented many children and young adults in crisis situations and who now affectionately call her “mom.” She is affectionately known in our household as “The Mother Theresa of Spring Branch” (a neighborhood here in Houston), and our family had the privilege of getting to know her several years ago when we attended Longpoint Baptist Church where Scotty worked in the nursery every Sunday morning. My girls adore Ms. Scotty, so it was no surprise when Lillian received a letter from her in the mail after her baptism. What a joy to have been able to witness your baptism. I don’t usually go to that service and I am so blessed that God arranged for me to be there. I have prayed for you and Lizzie on the 6th day of every month ever since you first came to the Faith Center and now Caroline too. My prayer this month is that God would develop in you a heart for missions and a desire for everyone to know about Jesus. So whenever you write the date and it’s the 6th, know you have been prayed over. I read the letter through fast-flowing tears to Lillian, one because of the profound gift of persistent prayer poured over my daughters from one who walks so closely with the Lord, and two because it was cemented: Lillian would now be a missionary on the other side of the world because that was Ms. Scotty’s prayer, and I would never see Lillian again after her 21st birthday (just kidding – I would love for Lillian to be a missionary – it is one of my prayers for my children as well). But as I pondered over Ms. Scotty’s letter and then turned to Luke 11:1-10 in the pages of my Bible, I was struck by one word: Persistence. When Jesus’ disciples came to Him and asked Him to teach them how to pray, He gave them the example of the Lord’s Prayer but then proceeded to tell them a story, a story I have not thought much about until recently. Jesus did not say that the door would be opened to the man in need of bread because of friendship or intimacy with the one on the other side of the door, or righteous living or rule following or powerful praying. He said the door would be opened because of one thing: Persistence. Let me ask you something: how many doors in your life would be opened because of the persistence found in your prayers? One? Two? Ten? None? If I am honest, maybe one or two doors. But that’s about it. Because, again, if I am honest, my lack of persistence boils down to two things: one, I do not believe the person on the other side of the door has the power or the interest in really opening it, and two, I am so overwhelmed by all the requests that seem to float up before me each and every day, I usually do not pray specifically about any of them. Or if I do, it is just one or two. I don’t know about you, but I want persistence in my prayers. And persistence takes sheer discipline and determination, along with the belief that the person on the other side has EXACTLY what is needed for the situation as long as I will keep standing there continuing to knock. The format is simple. It follows the an-acronym P-R-A-Y. P – Praise. Open each day with a prayer of praise. I started with Psalm 1 several months ago and have worked my way through the book of Psalms slowly ever since. I read a Psalm a day until I find the verses that “stick” in my heart for that day. R – Repent. This prayer of repentance was given to me in college by one of my professors, and I have used it ever since. I do not pray through the whole thing every day, but I find the section that gives expression to the sin I need to confess and pray that particular section. I also included a section to daily forgive those who have sinned against us as well as asking for forgiveness ourselves. A – Ask. Here is the fun part. And the persistent part. Following Ms. Scotty’s model, I have given us the space to persistently pray for specific people and/or situations on each day of the month. Use this section to organize your prayers and petitions before the Lord so that you can knock on the door of heaven in persistent, faithful ways. I have also included a space to pray daily for your marriage and your children. Two great resources I have found to be very helpful in my prayers for my husband and my children are Stormie Omartian’s The Power of a Praying Wife, and Jodie Berdnt’s Praying the Scriptures for Your Children. John Piper’s website, www.desiringgod.org has wonderful resources on prayer you can download for free as well. Y – Yield. This is actually my favorite part of prayer each day. Yielding. I take all the burdens of my heart, every sin I’ve confessed, every grudge I am releasing, every petition about which I am persistently knocking, and I lay it all at the trustworthy feet of Jesus. And I leave it there. In Someone’s Hands who are far more capable than my own. And finally, I have included a Personal Statement of Affirmation or Blessing, one that I do not use daily but when necessary. I speak words of life over myself, my situation, choosing to hear the Voice of the Lord about who He has created me to be, as opposed to the lies of the enemy. The one I have included is just a template or an example of what yours could look like. Feel the freedom to create your own. In all of the attached prayer guide, feel free to use as much or as little of it as you want to, but do me one favor: Pray. Persistently. We only have one chance, one life, here on earth to storm the gates of heaven, to affect people’s lives for all eternity. Will anyone’s life look differently because of your persistence? Because of your knock? In Ms. Scotty’s case, yes. I pray it looks differently because of our persistence too. Last weekend, I had the privilege of traveling to Annapolis, Maryland to visit the United States Naval Academy with my mom, dad, brother, Jason, and our two oldest girls. We were all there for a reunion – a reunion that probably seems small to most but was of epic size to our family. Fifty years ago in the Fall of 1963, my dad played for Navy in the Cottonbowl against the University of Texas. Their quarterback, Roger Staubach, won the Heisman trophy that year, and Navy went undefeated against some of the best teams in the nation, including Notre Dame, Michigan, Duke, and Army, their biggest rival. President Kennedy was assassinated just eight days before the Army/Navy Game was to be played, and the game was almost called off. But word got out that Jacqueline Kennedy, the First Lady, wanted the game to go on since the President would have wanted it that way. JFK was a U.S. Navy enlistee and made no secret of his love for the school and the team. Prior to the 1962 season, the President stopped to meet the team and shook every player and coach’s hand (Gary Lambrecht, “1963 Navy Midshipmen”). The Cottonbowl was played in Dallas, Texas, the same city where the President was shot just weeks before. And while Navy lost that day against the University of Texas (the reason why burnt orange was never tolerated in our house growing up, even though we are all native Texans – sorry, Longhorn fans), they still ended up the number two team in the nation. Not bad for a bunch of midshipmen. So we were there to celebrate. Celebrate a team. Celebrate the past. 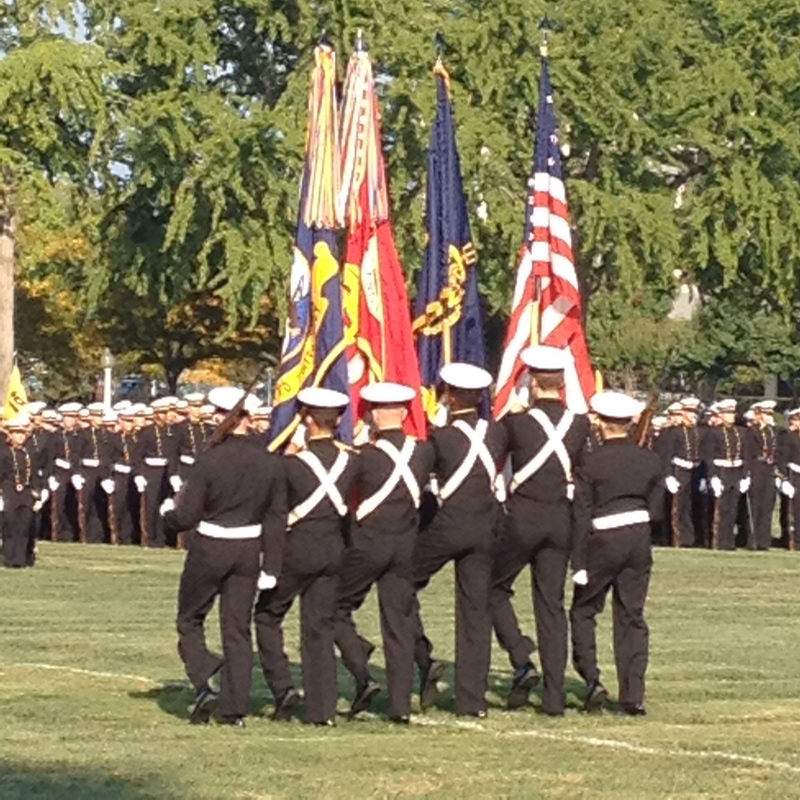 Celebrate the USNA. …but one thing stood out to me more than all the rest. It was where the Navy vs. Airforce football game on Saturday was played. 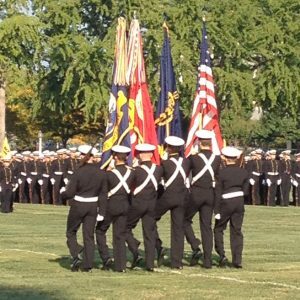 Navy’s stadium is called The Navy Marine-Corps Memorial Stadium, and like most football stadiums around the country, it has several decks of seating, rows and rows of bleachers, concession stands, and lots of enthusiastic fans. But one thing was different: what was written on the walls around the stadium. Instead of records of national championships or victories won or the names of great players, what is recorded are the names of battles fought by the Navy and the Marines. Battles where men and women lost their lives on the playing field so that those of us in the stands could live. I couldn’t keep my eyes off of the words – Normandy, Wake, Pearl Harbor, Midway, Iwo Jima, Okinawa, and the list went on and on. It was as if the players on the field were pointing to a greater battle they will fight one day off of the field. Battles that could cost them their lives – all for the sake of yours and mine. And it reminded me to take stock of the way I live my life each day. For we are all on a battle field. Souls are lost for all eternity moment by moment and second by second while I am consumed playing life’s foolish games. It reminded to put my heart and soul in the game of each day before me, to remember why I am here, to count the cost, to take risks, and to make proclaiming the Name of Christ the banner under which I live and the reason why I play. I am so very thankful for the men and women who have given their lives for my physical protection and freedom, and I am even more thankful for the Man who gave His life for my spiritual protection and freedom. My prayer is that the life I live, day in and day out, be worthy of the One who has given His Life for mine. May I live in such a way as to honor His sacrifice and the sacrifice of those who have gone before me.